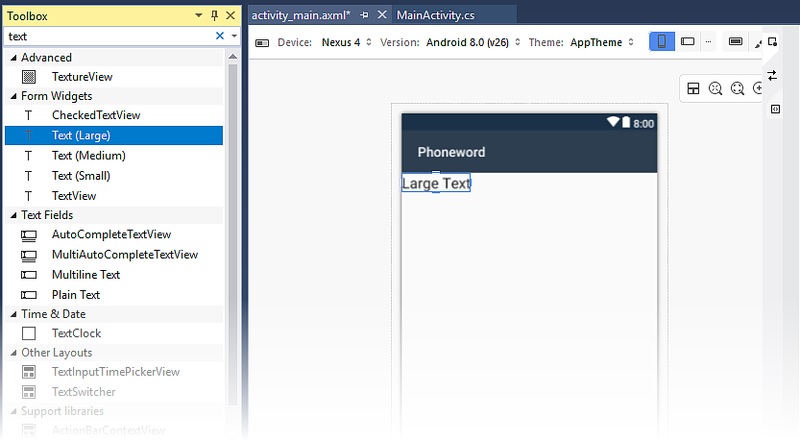 In this two-part guide, you will build your first Xamarin.Android application with Visual Studio and develop an understanding of the fundamentals of Android application development with Xamarin. Visual Studio 2019 or Visual Studio 2017 (version 15.8 or later): Community, Professional, or Enterprise. 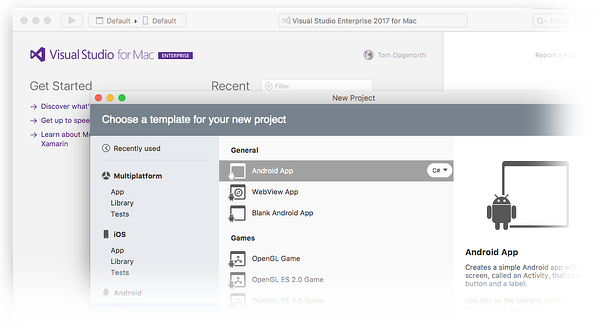 The latest version of Visual Studio for Mac. A Mac running macOS High Sierra (10.13) or later. 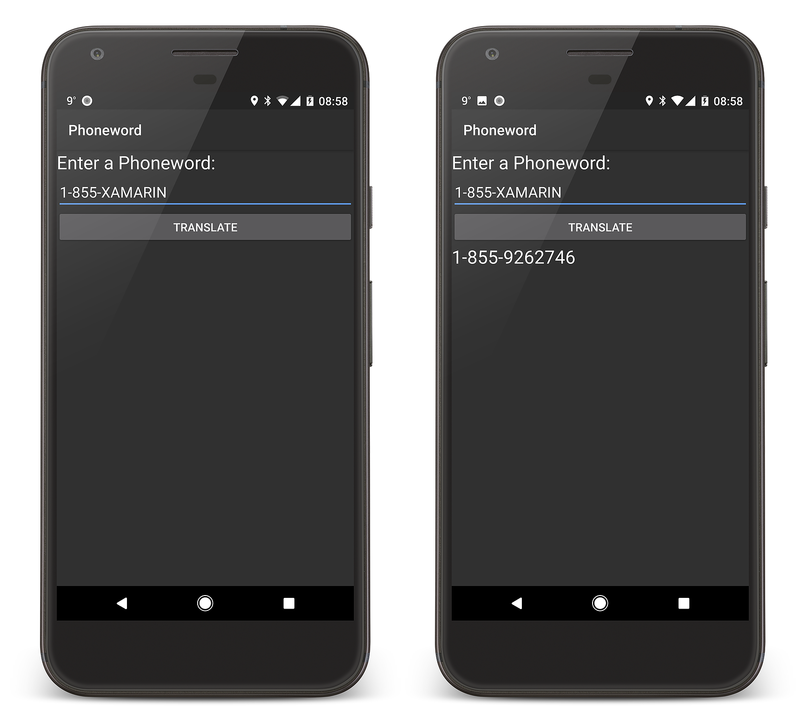 This walkthrough assumes that the latest version of Xamarin.Android is installed and running on your platform of choice. 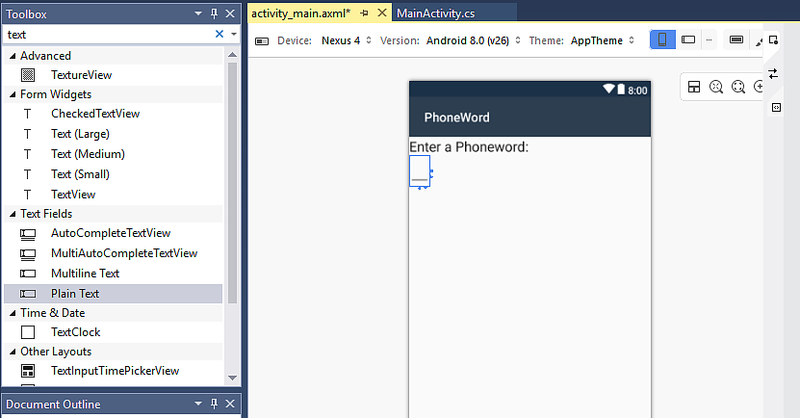 For a guide to installing Xamarin.Android, refer to the Xamarin.Android Installation guides. If you are using the Android emulator, we recommend that you configure the emulator to use hardware acceleration. Instructions for configuring hardware acceleration are available in Hardware Acceleration for Emulator Performance. Start Visual Studio. Click File > New > Project to create a new project. 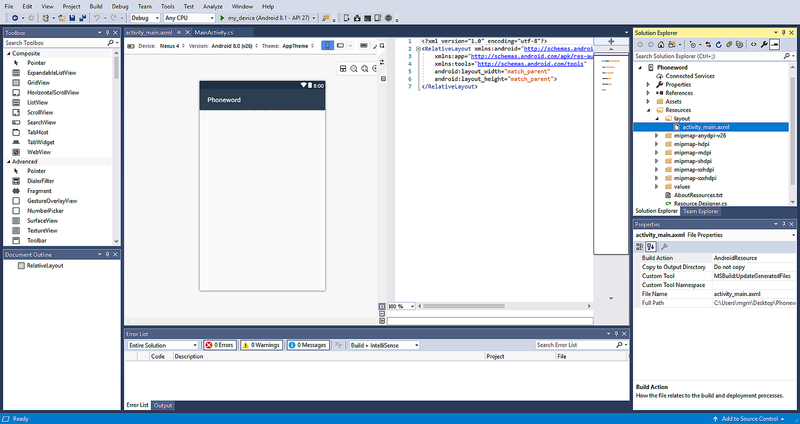 Newer releases of Visual Studio contain a slightly different app template. Instead of activity_main.axml, the layout is in content_main.axml. The default layout will be a RelativeLayout. 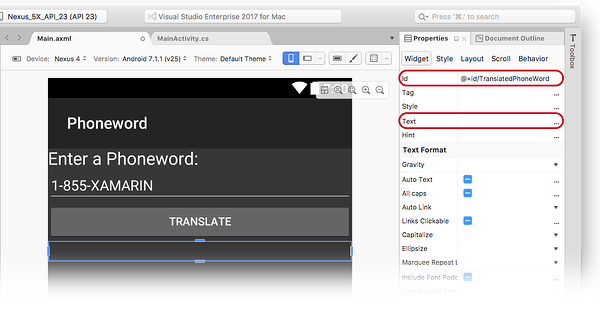 For the rest of the steps on this page to work you should change the <RelativeLayout> tag to <LinearLayout> and add another attribute android:orientation="vertical" to the LinearLayout opening tag. Save your work by pressing CTRL+S. Save the changes to the PhoneTranslator.cs file by clicking File > Save (or by pressing CTRL+S), then close the file. Save your work by selecting File > Save All (or by pressing CTRL-SHIFT-S) and build the application by selecting Build > Rebuild Solution (or by pressing CTRL-SHIFT-B). If there are errors, go through the previous steps and correct any mistakes until the application builds successfully. If you get a build error such as, Resource does not exist in the current context, verify that the namespace name in MainActivity.cs matches the project name (Phoneword) and then completely rebuild the solution. If you still get build errors, verify that you have installed the latest Visual Studio updates. 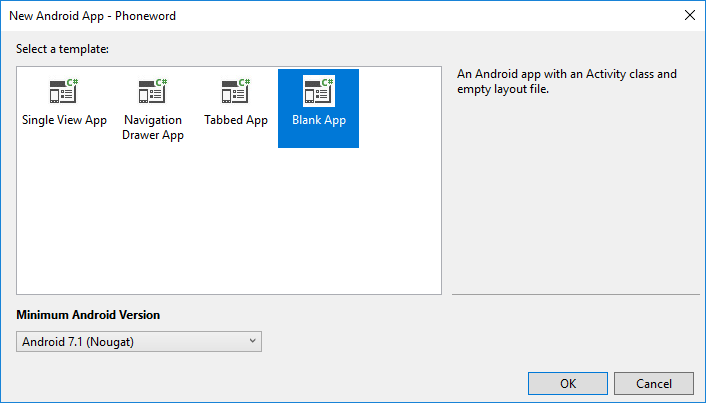 To run the app on an Android device, see how to set up your device for development. 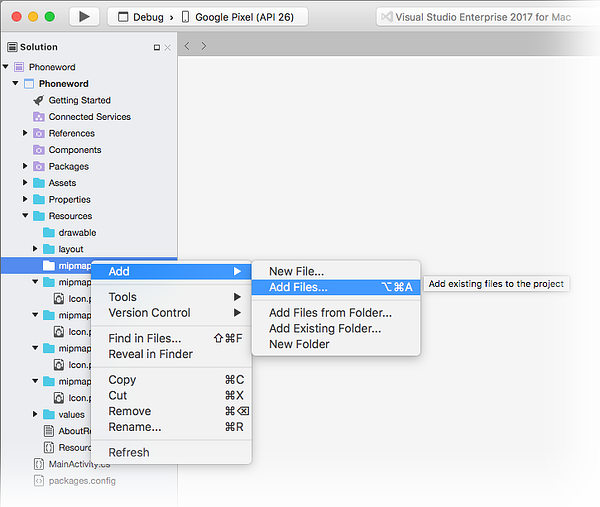 Launch Visual Studio for Mac from the Applications folder or from Spotlight. Click New Project... to create a new project. In the Choose a template for your new project dialog, click Android > App and select the Android App template. Click Next. 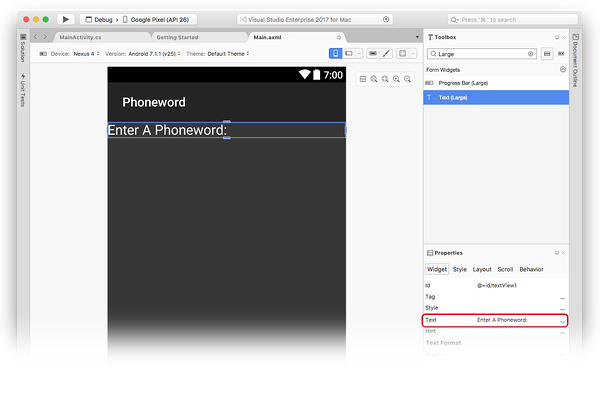 In the Configure your Android app dialog, name the new app Phoneword and click Next. 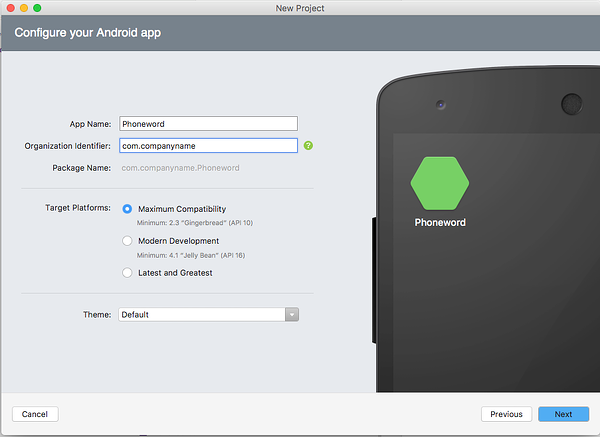 In the Configure your new Android App dialog, leave the Solution and Project names set to Phoneword and click Create to create the project. Select the Hello World, Click Me! Button on the design surface and press the Delete key to remove it. Save your work by pressing ⌘ + S.
In the New File dialog, select General > Empty Class, name the new file PhoneTranslator, and click New. This creates a new empty C# class for us. Save the changes to the PhoneTranslator.cs file by choosing File > Save (or by pressing ⌘ + S), then close the file. Ensure that there are no compile-time errors by rebuilding the solution. The next step is to add code to wire up the user interface by adding the backing code into the MainActivity class. Double-click MainActivity.cs in the Solution Pad to open it. If there are errors, go through the previous steps and correct any mistakes until the application builds successfully. If you get a build error such as, Resource does not exist in the current context, verify that the namespace name in MainActivity.cs matches the project name (Phoneword) and then completely rebuild the solution. 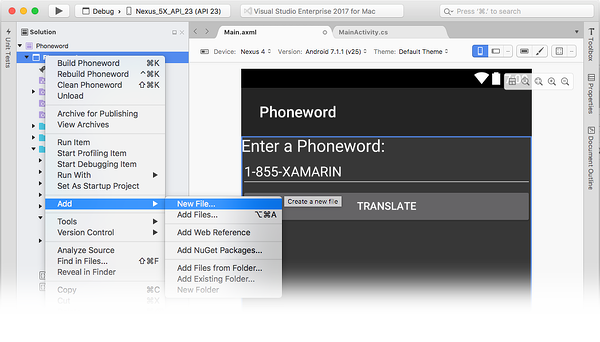 If you still get build errors, verify that you have installed the latest Xamarin.Android and Visual Studio for Mac updates. Click on the Delete button in the dialog. 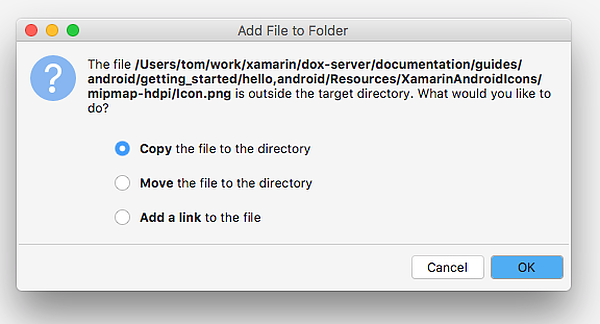 From the selection dialog, navigate to the unzipped Xamarin AdApp Icons directory and open the mipmap-hdpi folder. Select Icon.png and click Open. 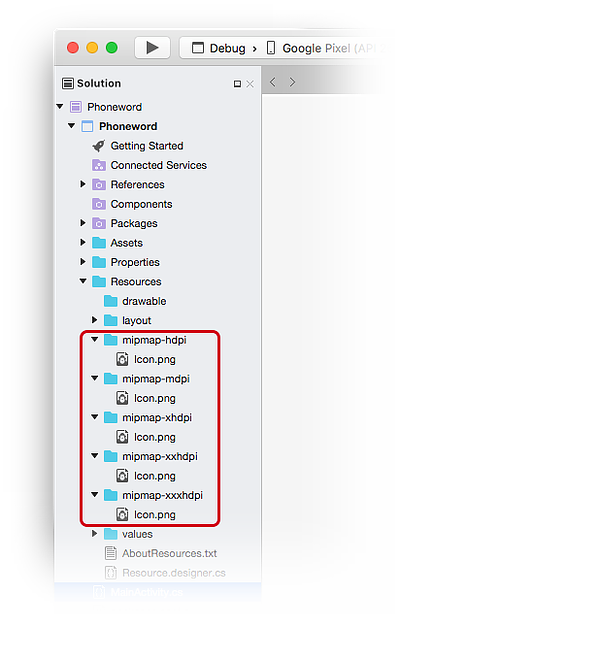 Repeat these steps for each of the mipmap- folders until the contents of the mipmap- Xamarin App Icons folders are copied to their counterpart mipmap- folders in the Phoneword project. 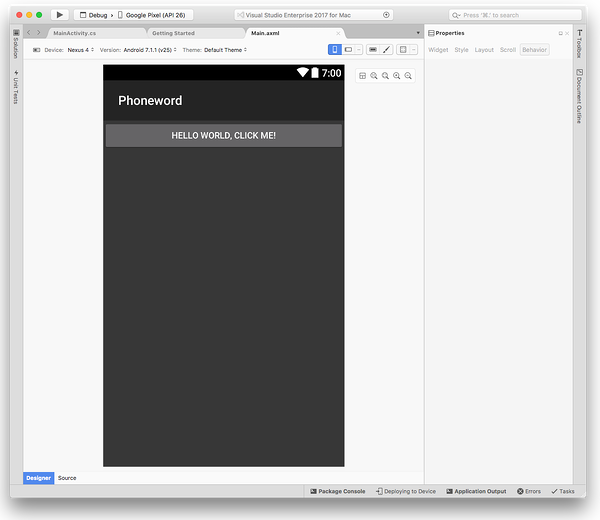 Congratulations on completing your first Xamarin.Android application! Now it's time to dissect the tools and skills you have just learned. Next up is the Hello, Android Deep Dive.